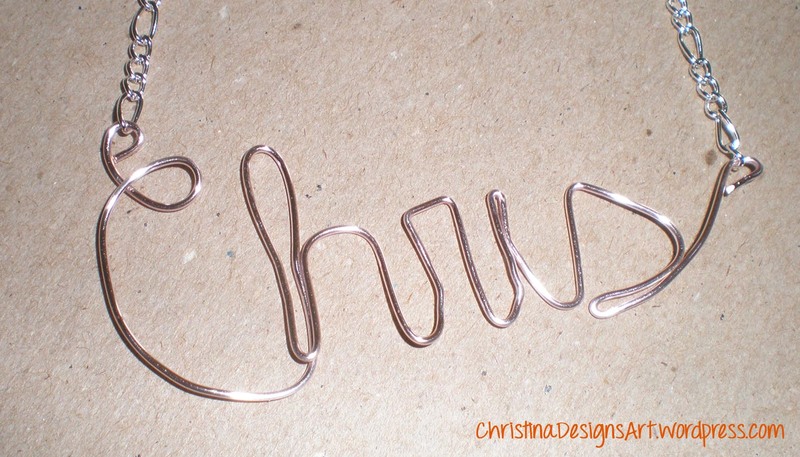 I was inspired by many other blogger’s who put together helpful tutorials for writing your name in wire, and making it into a pendant. I wrote my name on paper in cursive and got to work! Didn’t take too long and I really love it! Yes I cut my head off. I take my own pictures, sometimes in the mirror or at myself. Mostly they are awkward when they include my face! Making these inspired me to try a few other wire pendants! I’ll share those with you in another blog post! 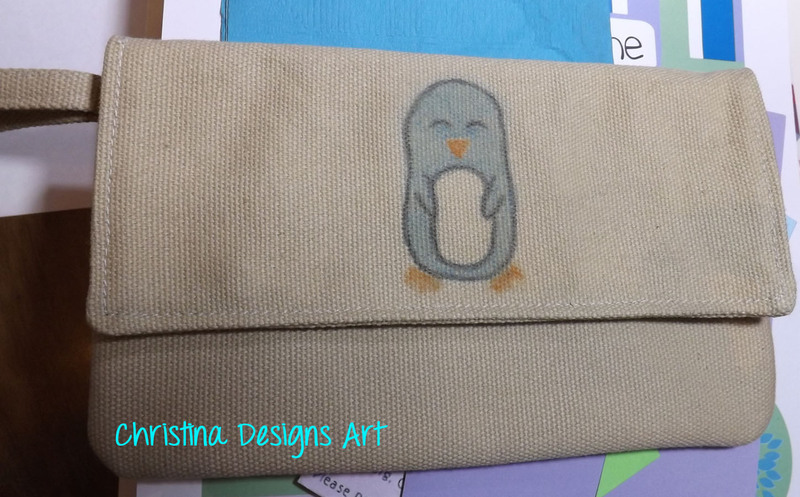 If this inspires you to make your own, I suggest you check out these lovely tutorials! Don’t feel like making it yourself? Try visiting these Etsy shops, priced to fit all budgets! This entry was posted in DIY, Jewelry and tagged Bead, customized pendant, Do it yourself, Jewellery, jewelry, jewelry pendant, necklace pendant, Pendant, personalized jewelry, tutorial, wire jewelry, wire working on October 25, 2013 by christinapertz1. Great little tutorial for you guys!! 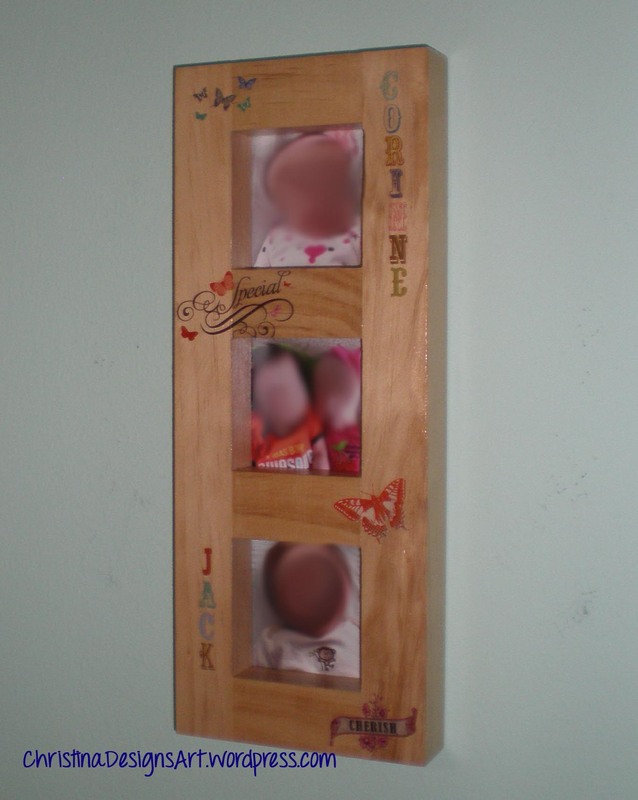 I wanted a pretty little picture frame to hold photos of my niece and nephew, this way I get a single of each, and one of them together in the middle! Perfecto! I bought this frame at JoAnns with a coupon a few weeks ago. I knew right away it would be the perfect frame to embellish. So, grab your supplies! You’ll need a cutting mat and x-acto knife, or sharp scissors to allow ultimate precision, a ruler or straight edge, scrapbooking stickers, washi tape, ABC stickers, rub-on stickers, etc, and lastly Mod Podge Gloss (for shiny) Matte (for flat). I used Gloss. 1. 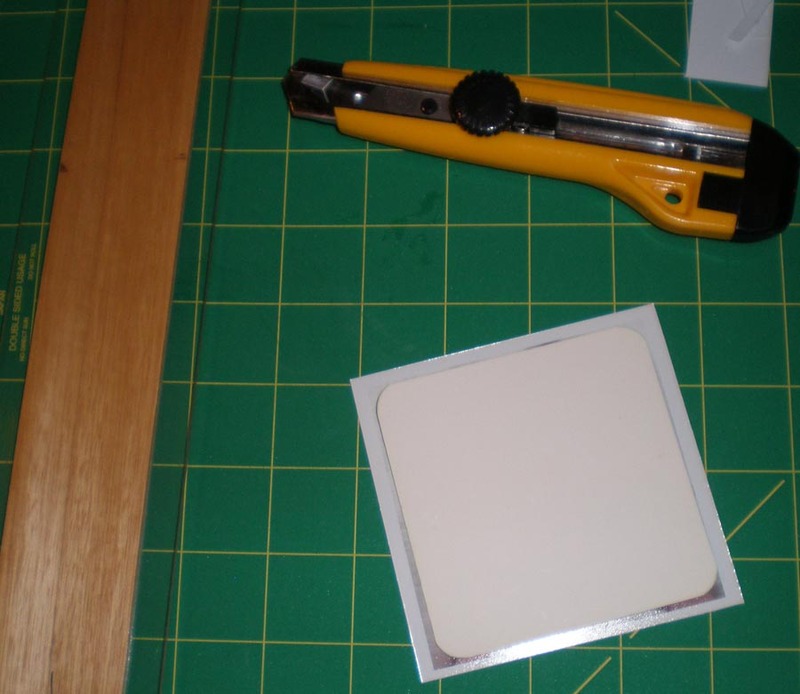 Cut photos to size, this is why a cutting mat and x-acto knife were used. I just placed my straight edge over the photo, and sliced the edge off. Worked perfectly. If you buy this frame you will notice the edges are rounded, I needed to cut those too since they didn’t all life flat inside the frames without them cut. Even though, you don’t see them! 2. All my photos are cut to size and ready to be placed inside the frame! Don’t they look cute already all rounded corners?? 3. 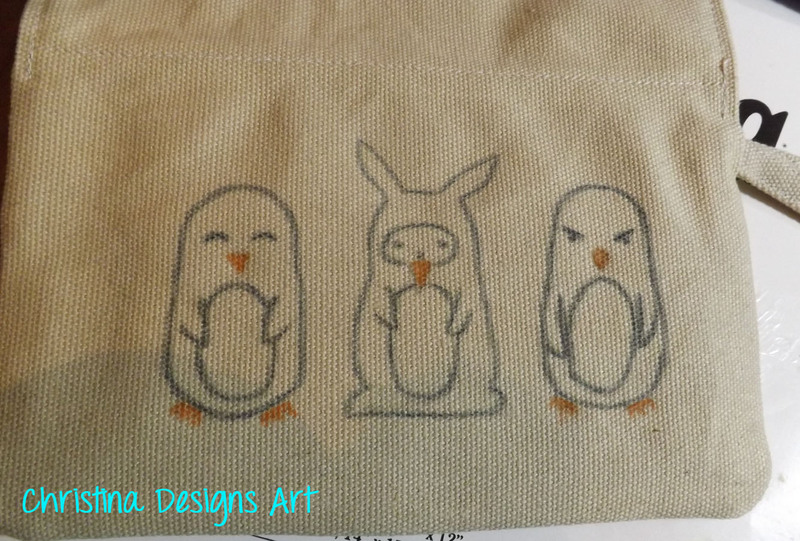 Now’s the time to grab all your stickers and start embellishing! 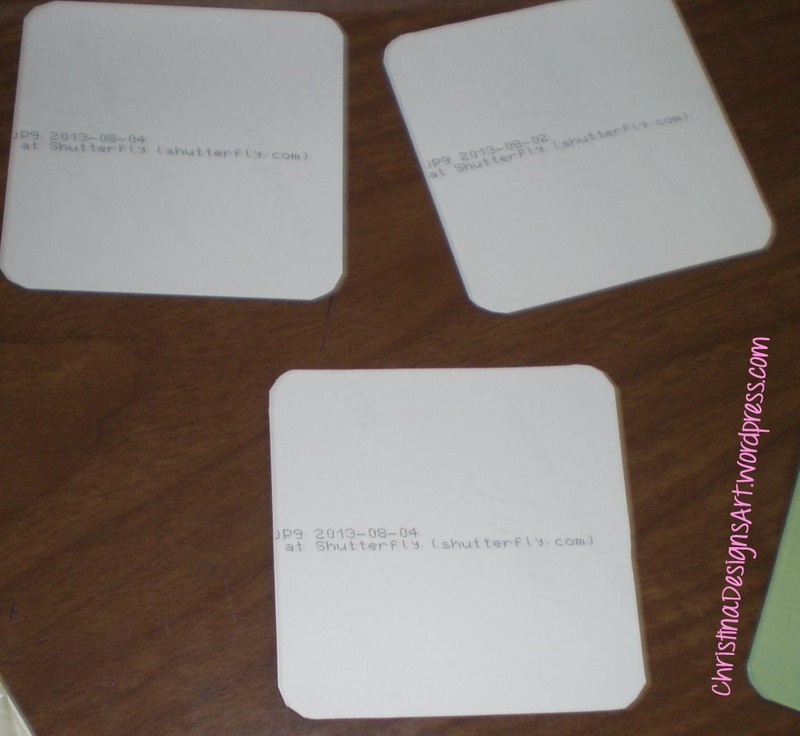 I’ll share a secret, I absolutely LOVE rub-on stickers! They work so nicely on unfinished wood! I have used them for many other projects…maybe someday I will share. But for this they gave the perfect affect, I wanted the stickers to float on the wood and be a little see-through. Most of these stickers, like the letters, I got in the $1 bins at JoAnns- you’ll find these in the scrapbooking area. You could use Washi Tape as well, I even bought some pink and blue, but then it didn’t go with my theme. 4. 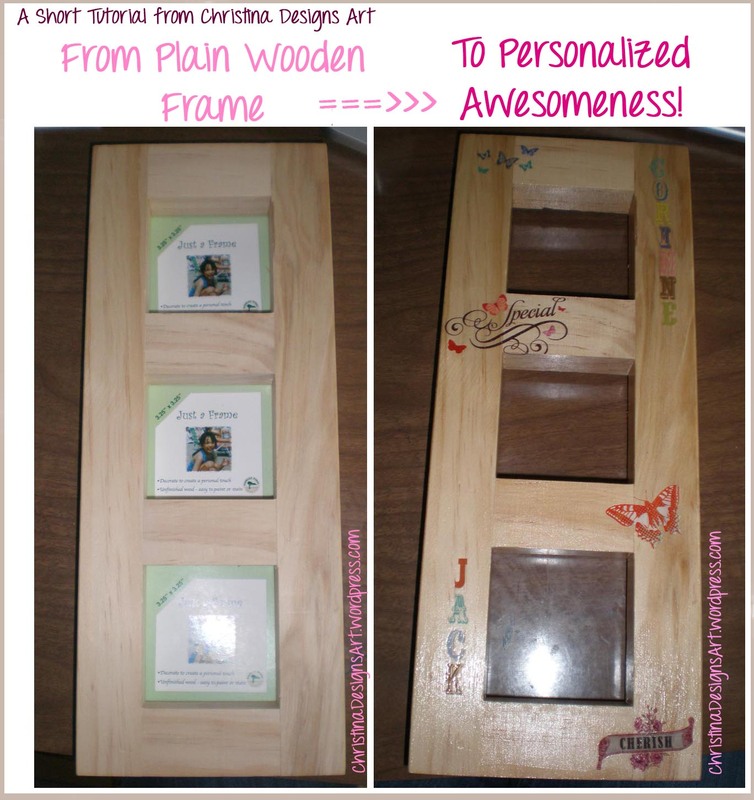 Apply your Mod Podge once you are happy with your design. I used about 5 coats of Mod Podge Gloss for this. Not because I didn’t think the first 3 worked, but because it can become uneven and I wanted to be sure to hit every surface, even the inner borders of the frames. Another tip for rub-ons, they are not like other stickers, once they are on, you cannot remove them without ripping and ruining the sticker. So be sure you like it first, play around while it is still attached to the clear backing! The finished product! Sorry, no absolutely-cutest-babies-you’ve-ever-seen photos allowed on the blog! You’ll just have to trust me, they are too cute! So what do you think? Easy as pie project that took less than 30mins, not including drying time! 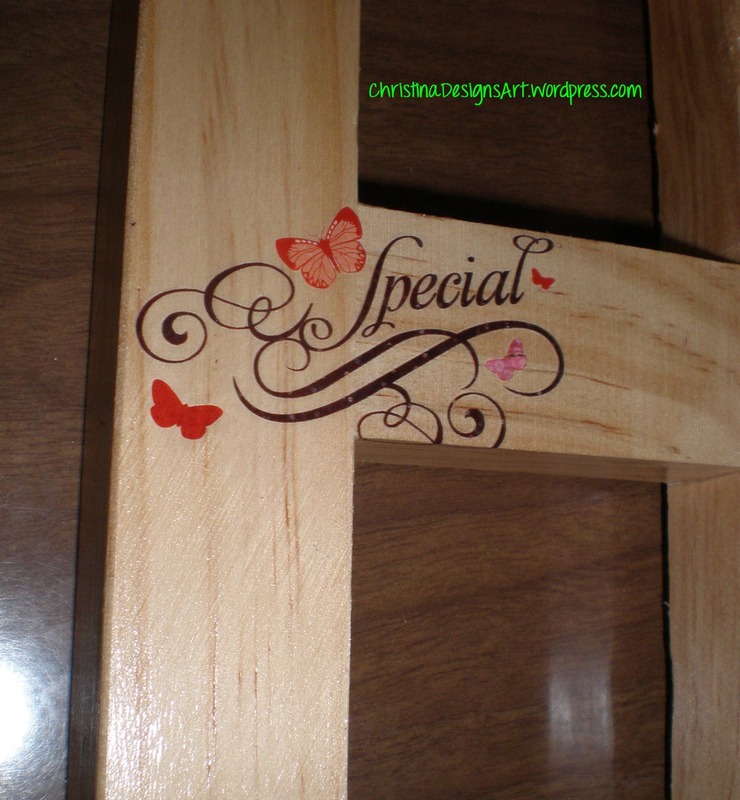 This entry was posted in Tutorial and tagged baby picture frames, crafts, DIY, paper, personalize a picture frame, Photograph, Picture frame, scrapbooking, Sticker, tutorial, X-Acto on September 6, 2013 by christinapertz1. I went to an outdoor wedding this past weekend that was “casual” so I already knew I was wearing a lovely sundress, but couldn’t decide what sandals to wear. 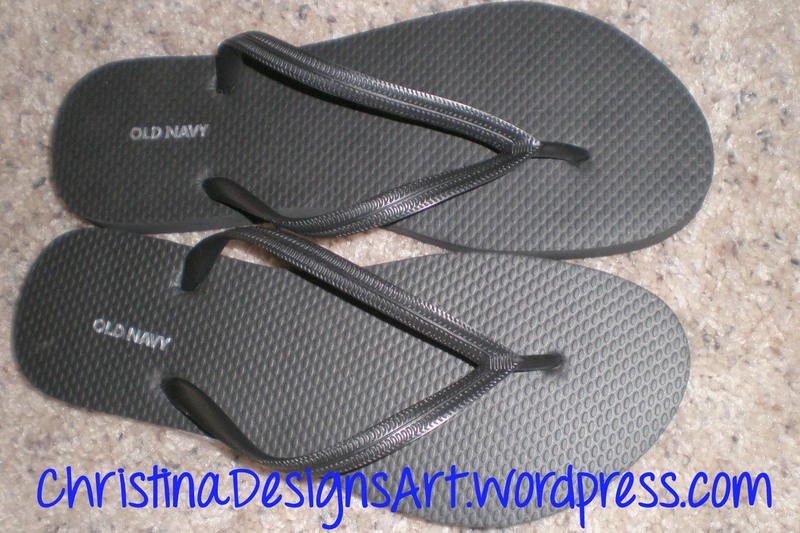 I had a pair of black Old Navy flip flops that I got last year (free from Crowdtap- read about that here), but plain flip flops seemed way too dressed down even for a casual outdoor wedding. So while I was working the other day I had an idea to FINALLY use some of that pretty trim that people always buy and I have no idea what to do with. So I brought my flip flop to JoAnns with me so I could compare and figure out how much I needed. I searched the trims and settled on a pretty black lacey beaded trim. I bought 3/4 of a yard, which was about 4 inches more than I thought I needed, but its best to buy a little extra! Plus 50% off coupons right now, so it was ok. I do have the 4 inches leftover because I didn’t mess up at all. I already know what I am doing with it! So it begins! Grab your flip flops and whatever pretty trim you want to use. 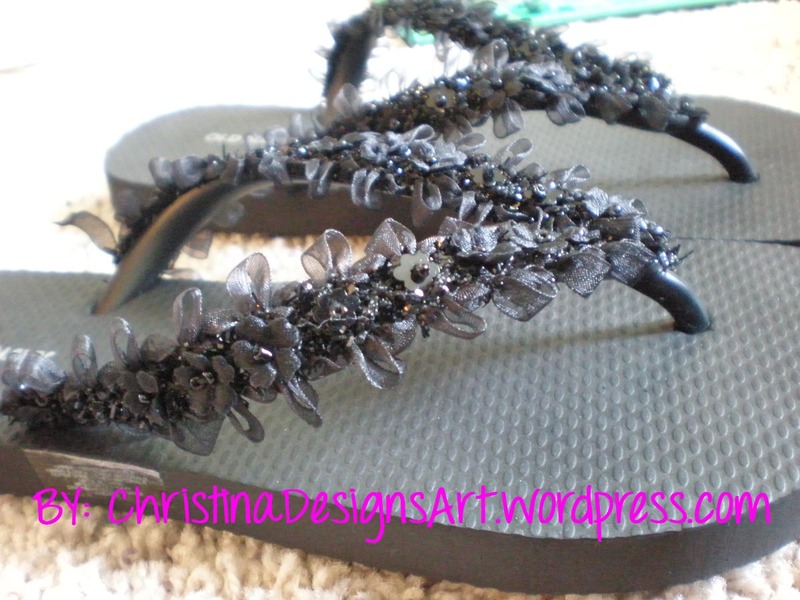 The trim I chose is a Beaded Lace Trim with flowers, all black. 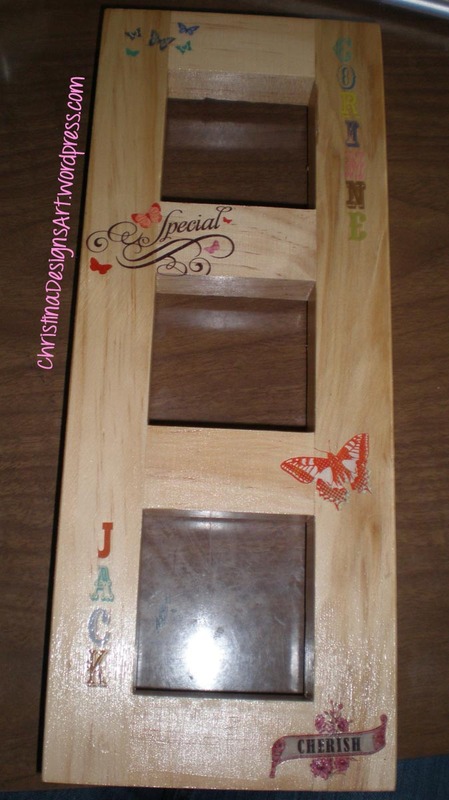 It is about 1/2″ wide and has about 1/4″ wide space to glue it down. I used E6000 because I love that stuff for everything! It worked perfectly. And now they look great and its such an easy way to dress up an outfit! And the final product! I love it! I got lots of compliments at the wedding 🙂 Check out some of these Party Sandals Under $50 that could be DIY’d a bit to make them even more fun! I’m a Beso.com affiliate and get a small portion for every click. PS. These are my photos, if you’d like to share them on your website, please remember to cite back to this website as is listed on the photo, and do not remove my website or alter my photos in any way. Please feel free to share on Pinterest/your blog/Facebook as long as it links directly back to my website/this post. Thank you! 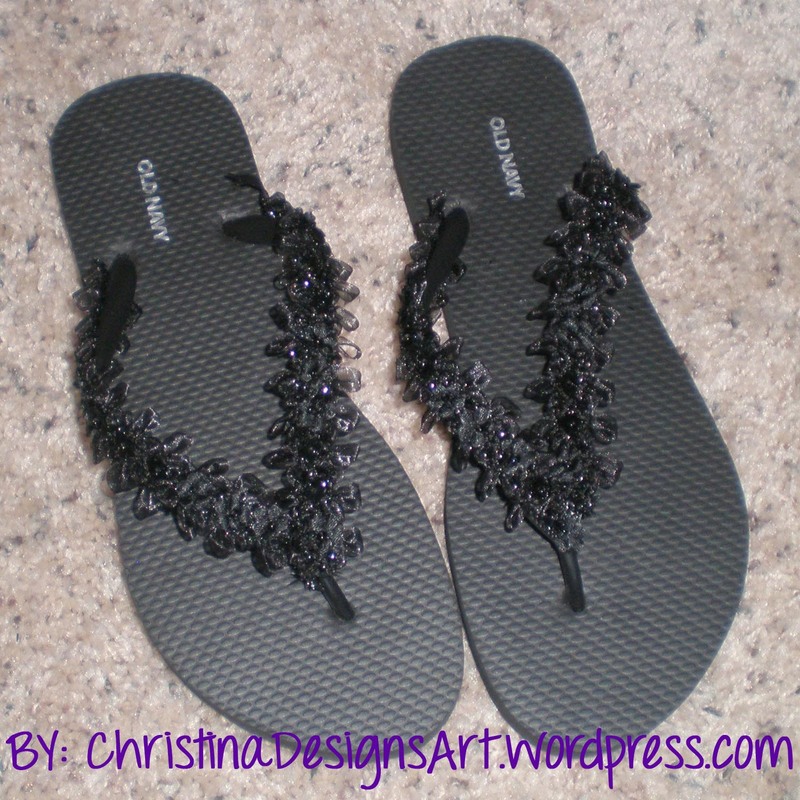 This entry was posted in DIY, Fashion, How-To, Refashion, Tutorial and tagged DIY, fashion, FLIP FLOP, Footwear, Sandal, tutorial on July 22, 2013 by christinapertz1. 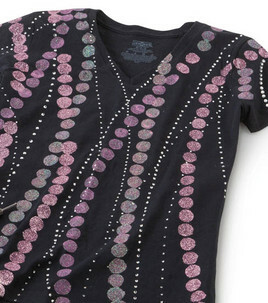 I love shirts with bling, but they are always like $10 more than a shirt without. And I don’t really buy tshirts anymore, unless they are somehow special, NYC, Vegas, California shirts etc. I do like some graphic tshirts, but I won’t buy them. 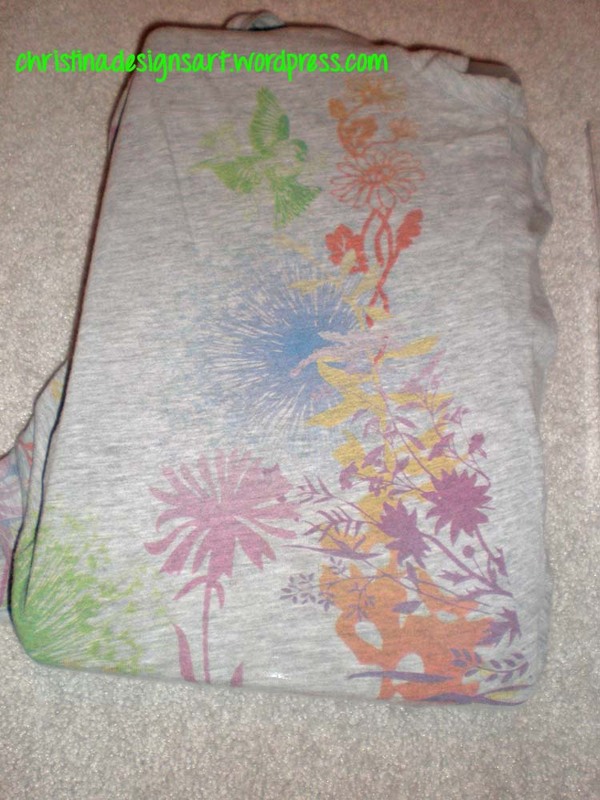 That being said, I’ve had this tshirt from Delia’s for years! I think I might have bought it in college even, and that would be over 6 years ago. But I love this shirt and wear it all the time, it fits great and I love the nature graphics! Step 1: Choose your shirt. 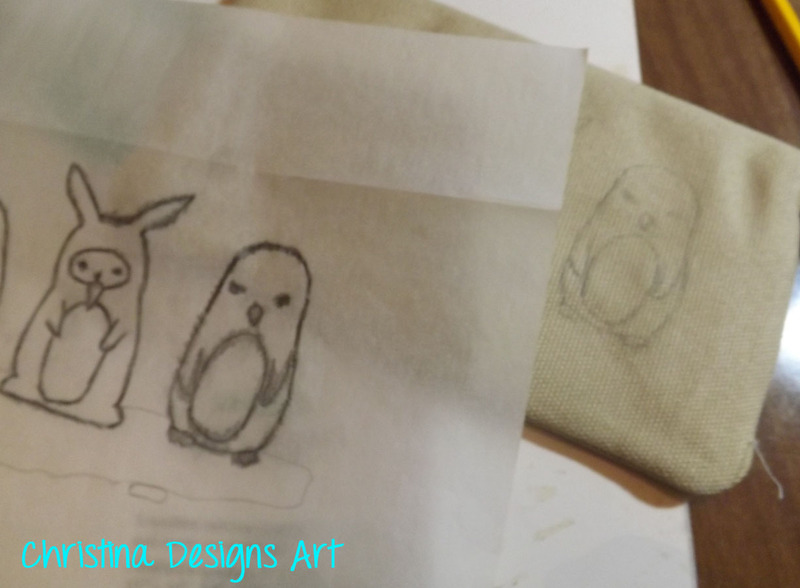 Place a piece of cardboard or plastic in between the layers so the fabric medium doesn’t bleed through. It is up to you if you want to tape it down, I did not. I also didn’t stretch this because it is knit and I don’t want it to dry all wrinkly. Scope out what you want to embellish. Step 2: Get started! 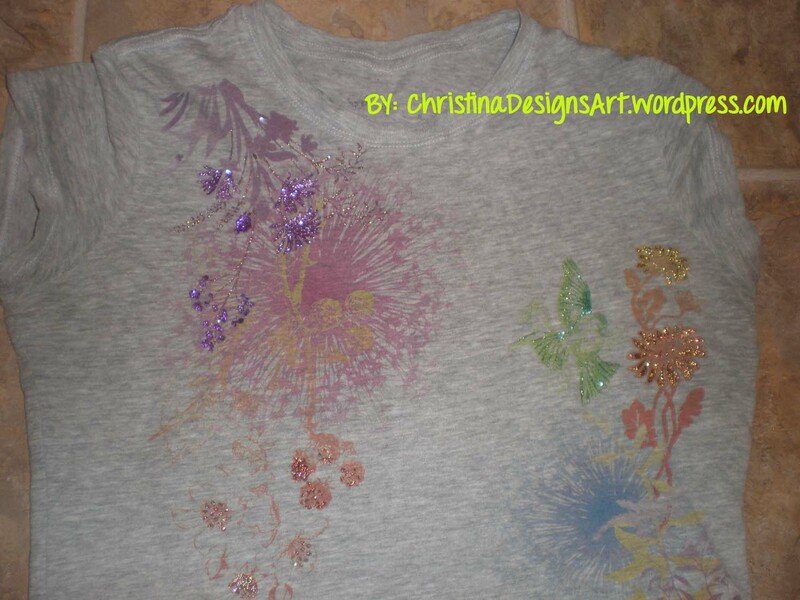 I put down 2-3 drops of Fabric Medium on a piece of plastic, then sprinkled glitter on top, then mix well. Try a little at a time, you can always add more! Besides if you paint it on and its not enough, wait for it to dry and paint over it again! 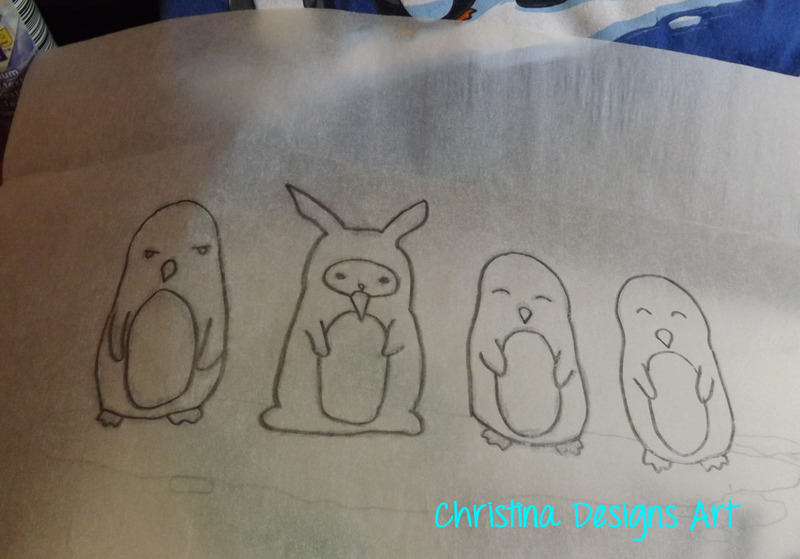 I chose specific areas on the shirt that were part of the upper half and included areas that could easily be added to without being over-whelming. 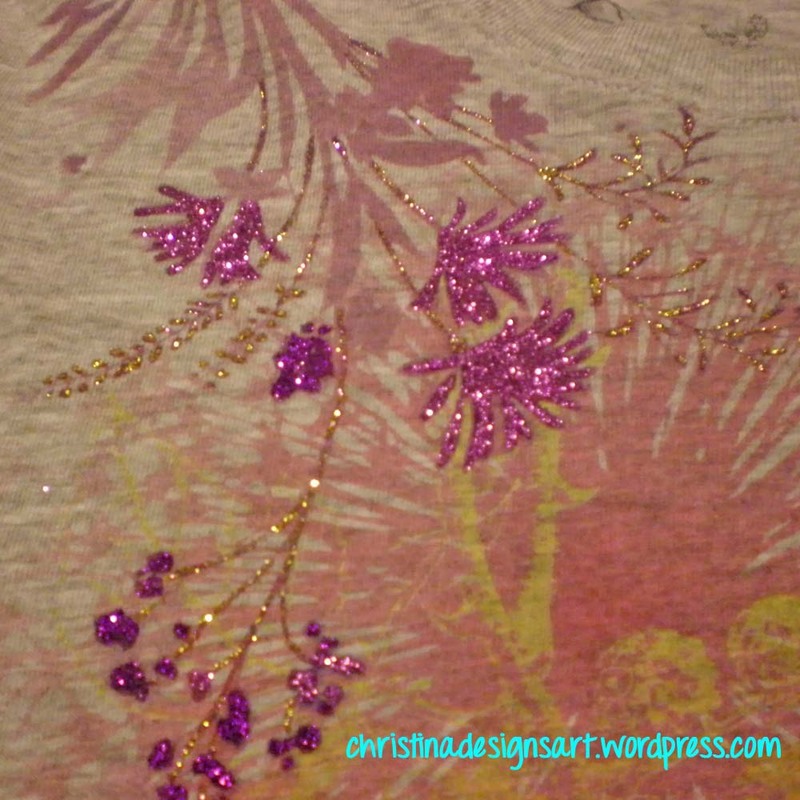 This section includes small purple glitter flowers. 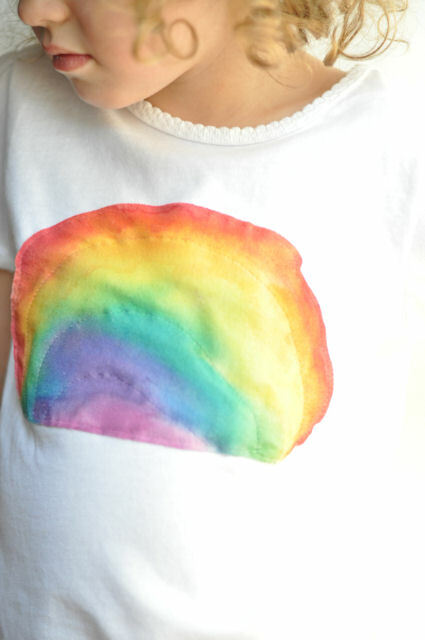 These I just dabbed at the shirt with a blob of glitter, I didn’t do much shaping at all. The gold I used very little glitter and I really had to take my time. 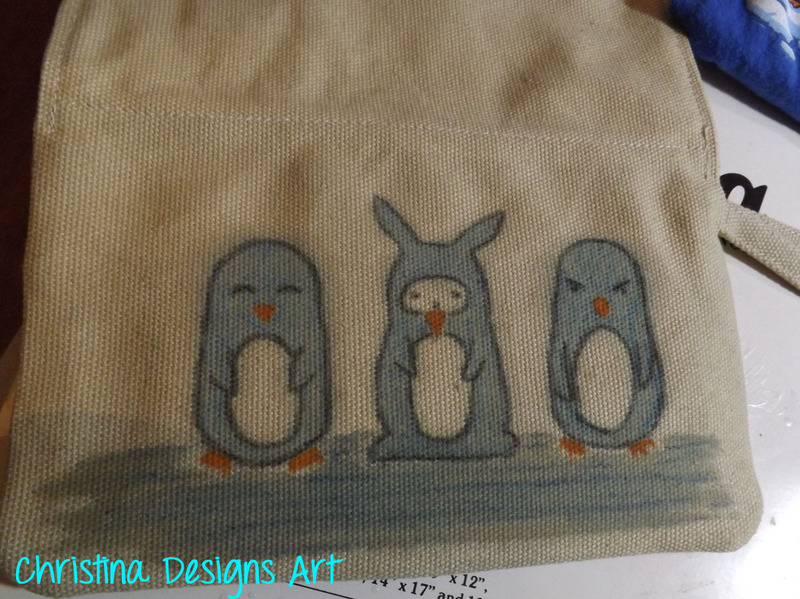 I am an inpatient crafter, you try not to be! You should try to find the thinnest paint brush possible (choices on the left are pretty good, even smaller is better!) for anything this size. I’m talking the size of a sharpened pencil! You do NOT need to buy a specialty paint brush, especially if you are just crafting and not fine art painting, plus they are pricey. I do fine art painting, that’s why I have these. Step 3: Before you freak out, wait for it to dry. See that darker thicker spot on the feathers of the bird? At the bottom there? I took this photo when it was still wet. The fabric medium has to soak in the shirt and it will look dark at first. 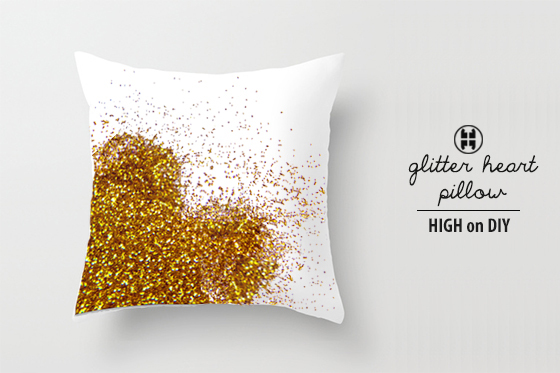 Don’t panic, most of that will go away, and again, you can always go over it with more glitter if you want. The bird is half light green glitter and half light blue glitter. I love how it highlights the wings. The orange flower is actually what I did first. It was so easy, this was the perfect place to start. Plus, its basically a coloring book, I just painted between the lines and if I went outside them, it didn’t matter because noone will ever know! The full shirt! I added some extra dots of glitter in red and orange on the middle and its not bad. It may have been odd placement, but I still like it. The colors give it some extra bling and it really takes one of my favorite shirts and makes it more awesome! I will hand wash this from now on, just to be sure, however it should not come off. Its not stiff either because of the fabric medium. I do not know what would happen if this went through a dryer. Not gonna lie, I’m looking for more clothes to add a little bling to! 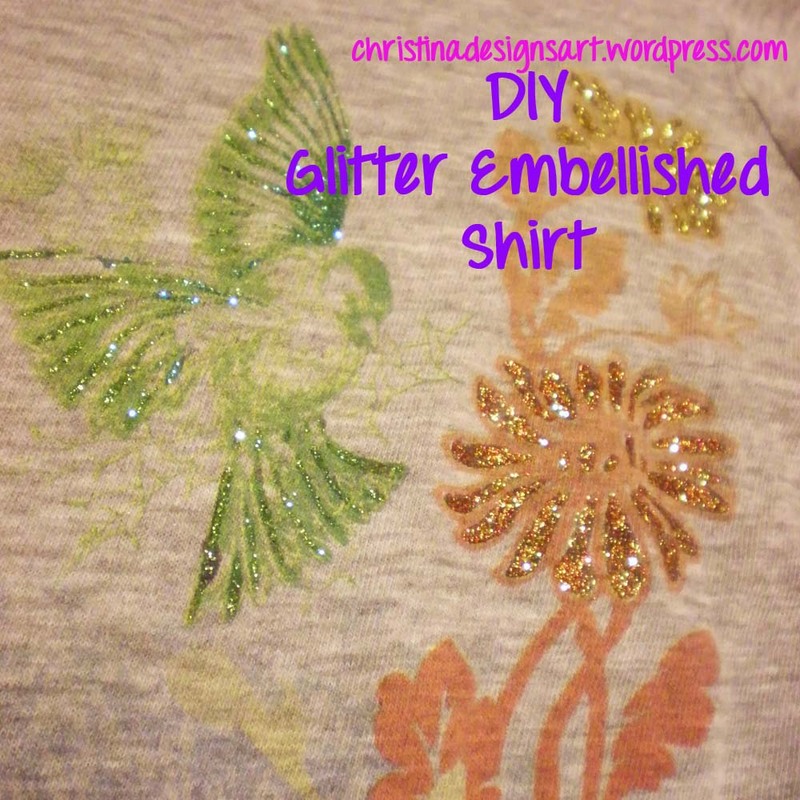 This entry was posted in DIY, How-To, Refashion, Tutorial and tagged DIY, fashion, glitter embellish, how to embellish fabric with glitter, refashion, style, tutorial on May 23, 2013 by christinapertz1. So I have recently tried out fabric paint as an experiment for the “color-blocking” I’m going to be doing on a refashion. I didn’t want to do it without first trying it out, so now I have and I love it! I wish I liked the shirt more though haha! But now I am confident I can do it on my latest real refashion, it will be a great tutorial for you guys too! Love these refashions? Check out my Pinterest boards for diys, refashions, recipes, inspirations, my creations, and more! 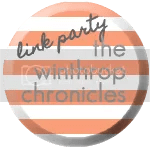 Don’t forget to visit the featured blogs! 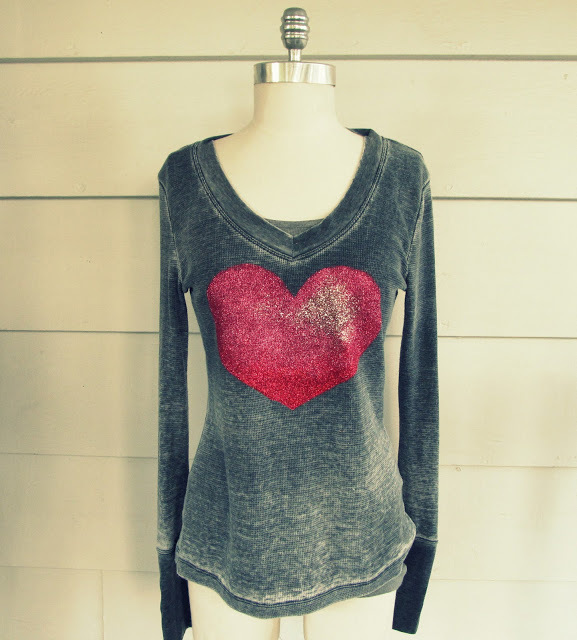 This entry was posted in DIY, Fashion, Inspirations, Pinterest, Refashion, Sewing, Tutorial and tagged clothing refashions, DIY, diy inspiration, fabric painting, fashion, glitter, hearts, pinterest, style, templates, tutorial on May 17, 2013 by christinapertz1. I’ve been going through many of my tshirts to look for a way to refashion them so I actually wear them. Like many of you, I have collected a bunch of tshirts through the years, many of them too big to actually wear in public, even though they look pretty cool. So I’m trying some ways to make them fitted, add fringe, or cutouts. Here is my round-up of inspirations! 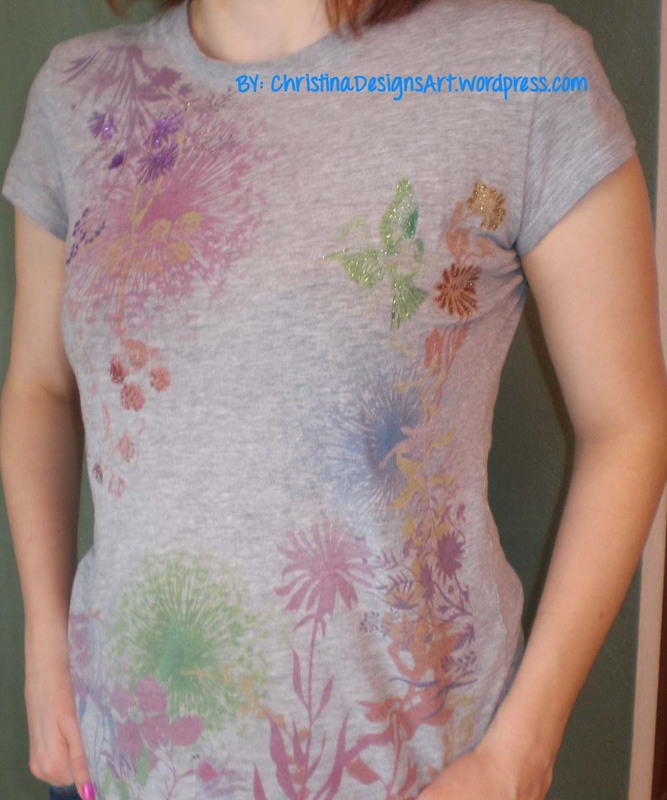 Men’s Shirt to Fitted Tshirt Inspiration by Hot Diggity Blog! DIY Drape Neck Halter from a Tshirt video by Whitney Sews – I actually tried this and ran into a problem. Will share with you next week and with ideas for what to do next. So what do you think? Are you interested in trying any of these? Check out my Pinterest boards to see my DIY Sewing Clothes and Refashion boards, for more ideas. 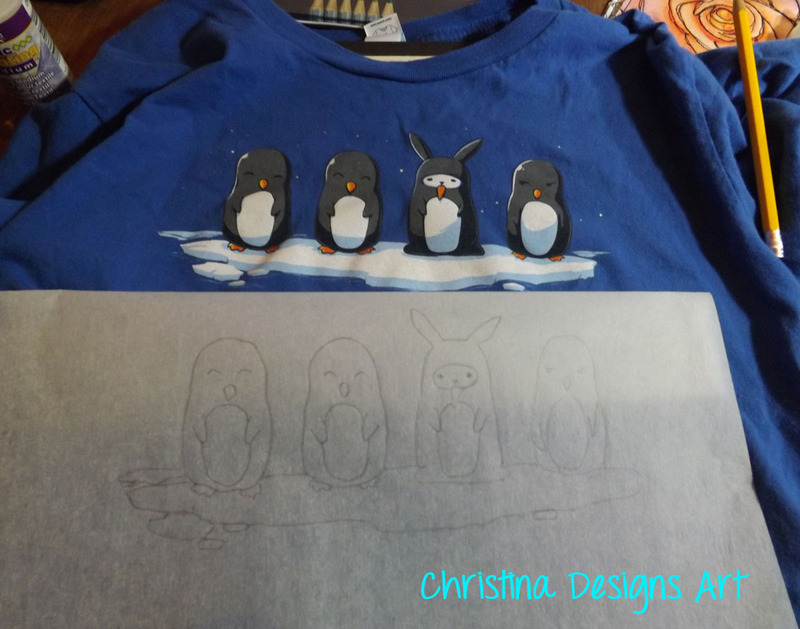 This entry was posted in DIY, Fashion, How-To, Pinterest, Refashion, Sewing, Tutorial and tagged DIY, diy t-shirts, fashion, pinterest, refashion, sewing tshirts, style, tshirt, tutorial on March 29, 2013 by christinapertz1.